Very Un-glamorously Barely Resisting Temptation! I do a good job of basically saving money over the past few weeks, brag about myself in a post and then what happens? My school’s student center installs a small sushi bar! Way too subtle Prince reference above… So, what’s red and goes vroom, vroom? My guilty little pleasure: my new Honda Night Hawk. 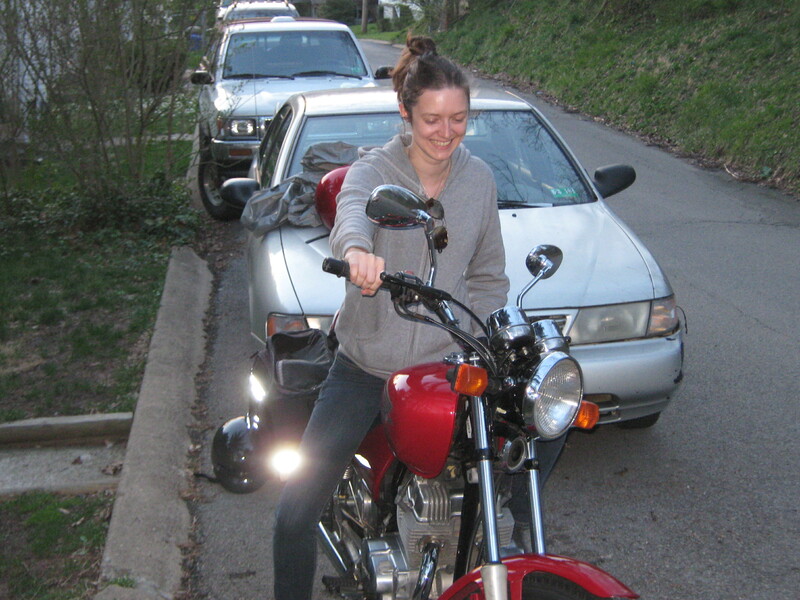 The Night Hawk is the bike many safety courses use in order to get your motorcycle endorsement on your license. It’s actually not manufactured anymore. They stopped putting them out a few years ago. But for ease of handling and reliability, especially for a first timer, they’re considered one of the best go-to bikes. Yes, I know, bad baby. I could give plenty of half-true reasons for getting a bike. They’re cheaper on gas, especially in the commute to work. It costs less to park them. It saves wear and tear on my car, which isn’t getting any younger. It costs less to insure them. Blah, blah, blah. But the truth is, sometimes budgets have to be a little more flexible to include a few things one loves. I’ve wanted a bike since I was a teenager. But something always mattered more. First there was a little baby as a young mother. Gas vs. diapers is an easy choice to make. Then there was the little, used car that cost the same as the bike. Bikes don’t have baby seats, so the little car won out. It’s still in use, by the way, great buy. There was always something that required more money. I was unable to save up for a bike because my spare change was going to pay doctor’s bills. Heck, what I’m going to be in for it total in terms of bike cost, insurance and driver’s safety course equals my absolute bare bones fantasy trip to Costa Rica or Ireland. So it did give me pause. Now, even though there is always something to save and pay for, I found myself in a position to have a little spare change for a bike. Again. For the fifth time in nearly twenty years. It was offered at 5% of my emergency fund goal. Much cheaper than the 10 – 15% I thought it was going to take. The gal even threw in the saddlebags and the helmet, saving me even more money. Since I have a little bit of known money coming in incidentally, and my summer coverage is 2/3 of the way assured, I had a decision to make. And I went against my budget for the first time. I guess I could’ve put the money into my savings account and been 5% closer to my savings goal. 5% matters a lot to me. I paid a little over two mortgage payments for this bike. But the investment in it goes far beyond a dollars and cents valuation. The ability to pick up and go on a sunny day just for a ride (especially at today’s gas prices!) is something I’ve always wanted. Packing the bike for a fishing trip with a collapsible pole, bait and tackle, and vrooming off to enjoy the ride is something I would love to do. Day trips to the local sights around here within an hour or so’s riding distance would be all the more enjoyed. I guess the thing for me is the metaphor of the bike. It’s not the destination that is the end goal. It’s the journey itself. It’s the being in the moment of where you are and what you’re doing. A bike is a very different experience from a car. You have no choice but to be hyperaware of what is going on around you. As someone who is very steadily and stubbornly future focused (my 5 year plans would make Stalin gasp), the bike is the one thing that keeps me in the here and now. My friend Roger likes to point to his heart attack as proof that one can work oneself nearly into the grave. Sometimes it’s important to ease the death grip one has on one’s budget and allow some play. The schoolmarm in me says, “Obviously not too much play!” And to be clear, if I wasn’t already out of credit card debt, I wouldn’t be doing this. If I had to finance the bike, I definitely wouldn’t be doing this. If I didn’t already have a couple of months of emergency fund built up, I wouldn’t be doing this. If I didn’t have a plan to pay for the summer and a good sense of what money is coming in and where for the next six months, I wouldn’t be doing this. But I have good answers to all those questions. I confess this is one of the most difficult things for me to do. I hate leftovers. I associate them with a) failed cooking b) poor planning and c) being poor. All of these associations are wrong, stupid and cost money. Groceries are (to my mind) the biggest variable expense in one’s budget. It’s the first place we tend to look when we want to cut down on costs because we can control whether we’re going to buy ramen or steak. We can’t always control whether the energy company is going to raise their rates through the roof. So not wasting the food you do buy is critical. The key to reusing leftovers, at least for me, is to be creative with them. I have a terrible time taking leftovers to work, and I’m not usually in a position to use the microwave. If I just lop off a slab of the leftover meat and reheat the vegetables for dinner, I have an immediate rejection instinct (and so does the boy). However, if I reuse those things in a different way, I don’t do so badly. Consider the pork roast I made in the crockpot a few days ago. It was a delicious bargain that I got at the Shop & Slave as part of the 5/$20 meat purchase. It was crocked with fresh garlic and ginger and then served with broccoli and rolls. There was quite a bit of it left over, and I dreaded having to eat it the same way a second time. The thought actually went through my mind: It only cost $4, maybe it would be better to just throw it away. No, no, no!! Bad baby! Such a path does not lead to financial security! I’m a firm believer that while there are big financial roads to ruin, like buying more house than you can afford or being hit with a medical emergency you cannot cover, the majority of us who are in debt and complaining about our finances have nickel and dimed ourselves into such a position. And throwing out the leftovers is a great example. So instead, I hauled out a couple of small packs of stir fry fixings — rice, sauce, veggies — that I’d also found on sale, diced up the leftover pork, and threw it all in a skillet and served it with a side salad. It was delicious! Didn’t taste like leftovers, didn’t waste the food. The whole meal cost maybe $6. Whoo hoo! So the key, then, is to be creative until it’s used up. If I’d had more leftover pork, I think I would’ve tried to make a pasta dish with it or thrown in some cheese, beans and fixings and wrapped them all up in flatbread. Keep changing up the taste, and you’ll never notice. Since leftovers are a big challenge for me, I’ll be regularly mentioning how I deal with them. And I would *LOVE* your suggestions as well.